Theresa Honeywell is tougher than you. Her work reflects her interests in the "manly arts" with a feminine twist. 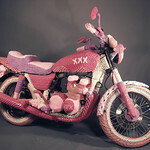 What motorcycle or jackhammer wouldn't want to be knitted into infamy? Her embroidered tattoos will live on long after you've gotten that celtic knot lasered off.